An enhancement to your natural brows. Microblading is performed with a hand-held tool with micro-needles grouped together allowing the professional to create fine incisions and manually deposit pigment into the upper region of the skin. Our Brow Specialist, Katie has been licensed in cosmetology for 10 years and has been certified in microblading for over a year and a half. is also certified in saline removals and in permanent makeup, where she can do powder brows, ombre brows, or shading for anyone that wants to elevate their microblading experience. She specializes in microblading corrections. Katie loves microblading because she loves to make people feel good and happy about themselves. prior to booking your Microblading consultation/ appointment at Urban You - Beauty Bar. behind the scenes action at Urban You! A consultation is always needed before service is performed. Bring a picture of brows you think would fit your face or create your desired look. To start the journey to your ideal brow, our experienced beauty enthusiast will perform brow mapping and color matching for brow perfection. Your first Microblading session can be booked out as early as 1-2 weeks from your complimentary consultation. 50% of the session fee is due at the time of booking. Microblading is a multi- step process and you shouldn’t expect to see full results after one session. A touch up appointment should be scheduled four to six weeks post treatment to achieve your desired brow. This is included in your initial cost. What’s the biggest difference from the traditional tattoo? The technique is done without the use of a machine. Hair strokes are imitated by manually depositing pigment and creating natural brows by following natural growth patterns. The pigment we use is free of metals and with the industry evolving and in high demand , certified , approved pigments for cosmetic us are specifically formulated for the face and skin. Can you remove microbladed eyebrows? Yes, we do offer Microblading removal services. 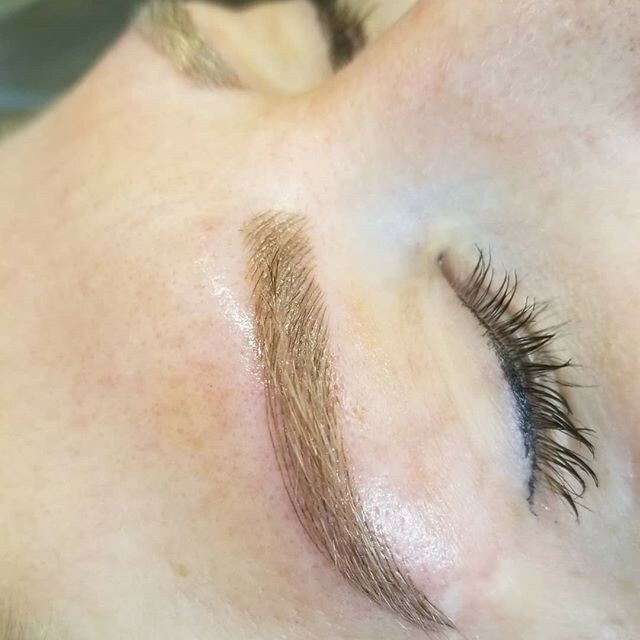 The number of sessions needed to remove microbladed brows may vary depending on how they heal and how deep the initial microblading was to begin with. What is the process for removing microbladed brows? Saline removal is a process of removing unwanted pigment or tones out from under the skin through various sessions so that we can safely lift out the pigment and allow proper healing so we can properly microblade your dream brows.